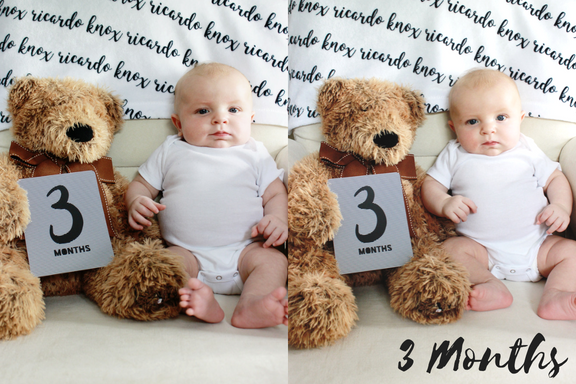 Stats: We don't have actual stats on our fast growing boy as he won't have another check up until 4 months old. But we are thinking he is around 14 pounds, maybe? He has definitely grown and his feet have really gotten big as they don't fit into his sleepers. We can't wait to find out his real stats next month. Development: These past few weeks have been so fun because Knox has really been able to focus and make tons of eye contact with us. He is SUPER smiley most of the time and his smile makes all bad things a distant memory. He moves his head around alot, checking out his surroundings. And his neck control is impressive; he can hold his head up for a very long length of time. I even started putting him in the Bumbo seat and he can hold his head/body up without slumping. Loves: Not much has changed, he still LOVES his sister. I adore watching their relationship, they both have so much adoration for each other. He also loves to eat as you can tell from his growing body! Dislikes: Right now his only dislikes are being hungry and being sleepy. He has had a couple fits of screaming because he was so hungry and was unaware that his milk was right in front of his face. Sleeping: We started using The Baby Sleep Solution to help him sleep through the night. Right now Knox will go down around 8 p.m. and sleep until 5 a.m. most nights! We are thankful for those nine hours of uninterrupted sleep. He will wake up and eat just a tiny bit and then go right back to sleep which makes me think he will drop that 5 a.m. feeding soon. I'm super hopeful that he will sleep 12 hours straight (just like his sister did) very soon. Diapers: Still in size 1 Pampers, but once we are done with the opened box, we will switch to size 2. We did start using size 2 overnight diapers. Eating: Since we started using The Baby Sleep Solution, Knox is primarily bottle fed so we know how much milk he is eating throughout the day. He gets pumped breastmilk and eats every 4 hours. I have quite a LARGE supply of milk and already have almost 2,000 ounces frozen. I had no where near an oversupply with Kendall, it is incredible how different my body is this time. 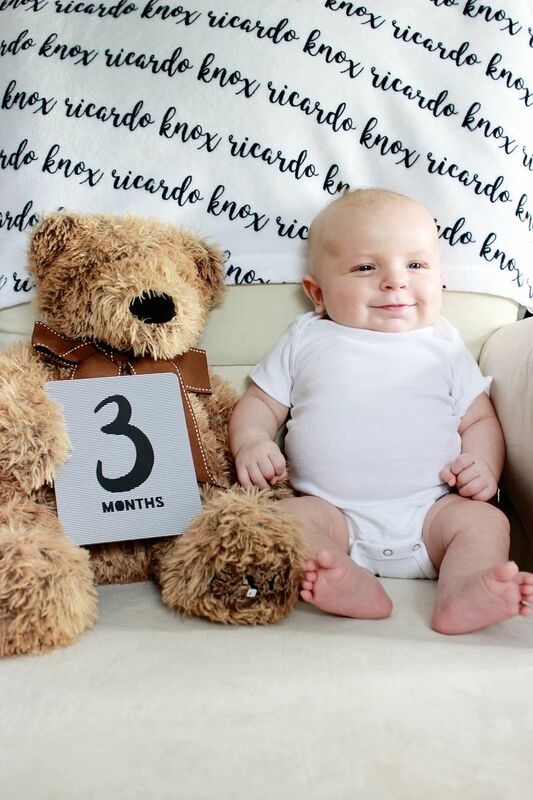 Clothing: Most of his clothing is size 3-6 months, but there are a couple 3 month outfits that he can wear. It still amazes me how two different brands can be labeled the same size and yet vary in size drastically. Miscellaneous: This past weekend we traveled to Illinois/Missouri for our niece's graduation, making it Knox's first road trip. On the way there he was a rockstar as we split the drive up over two days. For the return trip, we made the trip all in one day. The first six hours of the ride were perfect and he was so easy going. However, the last three hours were not so fun. I couldn't blame the poor kid, I wouldn't like to be stuck in a car seat all day either. We decided that we won't be traveling over six hours at a time anymore until he is older. Thats awesome he a good sleep. I can't believe how fast he growing up. My daughter didn't become a good sleep until she was 5 months old.